Super 8 wants to create the experience of a high-school nerd growing up in Ohio in the summer of 1978. As a former Ohioan who was in high school that summer, I know exactly what Abrams is going for. It was an exquisite summer of sci-fi: Star Wars and Jaws, the mystery of friendship and hormones and the wonders of outer space. The movie opens with an industrial accident at a small town near Dayton. Then a diminutive high-school boy sits on a lonely snow-covered porch of his ranch-style house as neighbors and his father hold a memorial lunch. It’s a town of small, close-cropped houses that every kid wants to escape from. Neighbors wonder about how the boy will get along without his mother. A long-haired, long-sideburn dude drives up in a beat-up, yellow Mustang – the car’s engine rumbling over and over after the ignition shuts down – and goes inside. An argument ensues. The boys’ father, a cop, cuffs the dude, brings him back outside, and puts him in his police car. A title card says “Four Months Later.” Then the action starts. What Abrams has here is essentially a salute to Spielberg. What follows is the perfect amalgam of every Spielberg movie ever made: a distilled blend of Jaws, Jurassic Park, Close Encounters, Saving Private Ryan, and ET, with a good deal of Stephen King's Stand by Me for good measure. Only Abrams adds his own metafictional gloss: the five young high school friends are filming a movie. What they capture on camera however is more otherworldly than anything they bargained for. The hero of the film, Joe – the sad boy on that porch – is clearly a stand-in for the young filmmaker, and this is also clearly a very personal story. Abrams gets every detail of small-town ’78 Ohio just right – from the men’s greasy hairstyles to the sad, brick-and-stone ‘50’s ranch houses stuffed full of model trains, sci-fi-posters, film equipment and obscure magazines. The “production values” here are clearly borne from intimate experience. Joe is a bit of a blank slate: his mother just dead, all he has to cling to his an old locket she gave him, which has her picture holding him as a baby. What keeps him going is his friendship with a bigger, fatter kid named Charles, who is making a zombie movie, and has that talkative, obsessive energy of preteens discovering their first passion. 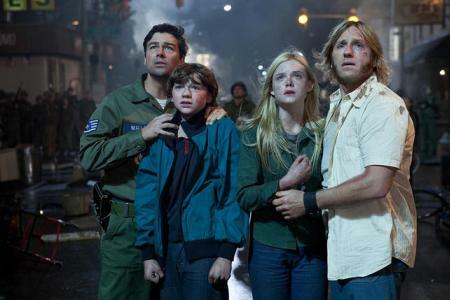 There are other recognizable Jr. High characters too: the always slightly dazed cameraman, the shy actor who only comes out of his shell around Charles’ schemes, and the buck-tooth kid who carries his M-80’s everywhere and only wants to blow things up. Meanwhile, Joe’s father, a high-ranking cop, has his own problems: equally shut down as Joe, he won’t let his son see him crying in the bathroom, and his anger at the Mustang-driving dude (Louis Dainard…inevitably, Joe gets involved with Alice, Dainard’s daughter) is clearly a bomb waiting at the heart of the movie. Then a train derails in front of the kids as they are filming their zombie movie (the scene of the kids doing their movie – and the lead up to the train derailment – is one of the film’s most hilarious – and maybe an instant cinematic classic). Something…well, alien…escapes from the train. And then everything goes to hell. Like any good monster flick, what’s loose in the town is highly metaphoric. One could say it stands for the bad blood between Joe’s father and Dainard. One could say it’s the grief over the death of Joe’s mother. Maybe it’s physical manifestation of the Spielbergian imagination influencing the young filmmaker’s mind. Whatever it is, it’s got eight legs, moves likes a JJAbrams “Fringe” cross between a spider and a tiger, and is out for blood. Like Jaws, we only slowly get the monster revealed from the shadows. Members of the community start disappearing one by one. This is classic sci-fi film making. Only a few big special effects scenes happen in the movie and they’re used with style. Almost a rebuke to a summer of X-Men and Transformers stuffed full of CGI effects, Abrams takes his time – almost the entire film – setting up the story, and lets the story, rather than the effects, drive the emotion in the film. The characters even comment about it as we go, explaining that setting up a good story is what makes us care about the characters (it’s why they are out there filming on that train station, and why they draft the young ingénue Alice as a love interest for the boys, and subject of peril for the plot). The story is formulaic, but for a summer sci-fi, Abrams handles it with aplomb. Joe learns to be more of a hero – like his father – while his father learns to appreciate his kid. Meanwhile, Joe gets to look the monster in the eye, and everything is resolved when Joe decides to let go of his mother’s locket. The locket sails up to the town water tower, which then implodes with a shower of water, like a baptism, over the war-torn town. If anything, Abrams goes too far in setting up the story of the characters. By the time we come to care about the reality of the inhabitants of this town, the introduction of the zombie-movie-style monster feels tonally wrong – too comic book-y. This could have easily been fixed by holding the monster to a higher standard. No one needs to die, except perhaps the bad-guy Sergeant, and even he could have been more than a one-dimensional foil. But I think Abrams is on too much of a Jurrasic park style role and felt more blood needed to be shed to get proper monster movie chills. I just felt that was the wrong metaphor for this story, which had started out to be so much more. If Joe is really the empathic one in the town – the misunderstood dreamer who only wants to get away and live his life – then the monster is his doppelganger, and it should have a conscience too. It’s a great film. But by missing this crucial insight about the monster, it misses out on being a sci-fi classic. I wish it could have gotten there. It’s a bit like ET without getting that final music score. A great tribute to Spielberg, and a wonderful bit of nostalgia for all us nerds who group up loving those films. In the end almost, but not quite, Spielbergian.